In both the primary and general election cycles examined in this study, Democrat Martha Coakley was the leading newsmaker. But the bigger story was Republican Scott Brown’s emergence from near obscurity to a major newsmaker in the course of a few days. 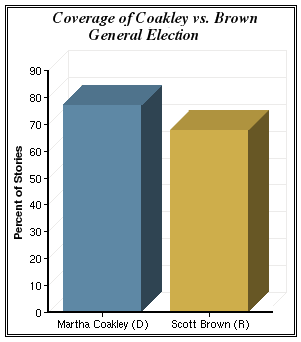 In the final two weeks of the general election campaign, Brown was a significant presence in 68% of the 195 stories and opinion pieces studied in this report. (To register as a significant presence, someone has to appear in at least 25% of that story.) That still lagged slightly behind Coakley, who was a significant presence in 77% of the stories from January 6-19. But it marks a dramatic increase in coverage for someone who was almost an afterthought during primary season. And it also suggests that in the media narrative at least, this race was less about him than about Coakley, the Democrats and Obama. From September 1-December 8, Brown was a significant figure in only 8% of the primary campaign stories (28 stories in all). One reason clearly was the perception that a Republican couldn’t win a Senate race in Massachusetts. Another was the lack of a competitive primary race on the GOP side. Brown won 89% of the primary vote against perennial candidate Jack E. Robinson, who himself was a significant factor in a mere 1% of the primary stories. It was a different story in the Democratic primary fight, which attracted far more media attention. Coakley was the front runner from the start and the eventual winner in the multi-candidate Democratic field, with 47% of the votes cast. She received the most coverage of any candidate in the newspapers and wire copy studied. Of the 362 news stories, editorials and op-eds produced, she was a significant figure in 51%, or 183 of them, more than any other candidate. But besides Coakley, three other Democratic candidates received a substantial amount of coverage from September 1-December 8. Michael Capuano, who finished second in the race with 28% of the vote, received the next most coverage, appearing as a significant figure in 44% of the primary campaign stories. Stephen Pagliuca, who finished fourth with 12% of the vote, came next, a significant newsmaker in 35% of the stories. Alan Khazei, who narrowly edged out Pagliuca in the vote (13%), received somewhat less coverage, registering as a significant newsmaker in 28% of the primary coverage. One candidate who was largely ignored by the media during the primary campaign fared little better in the general election—even though he was still on the ballot. Libertarian Party hopeful Joe L. Kennedy (no relation to the famous family) was a significant factor in less than 1% of the primary coverage and did only slightly better (2%) from January 6-19.